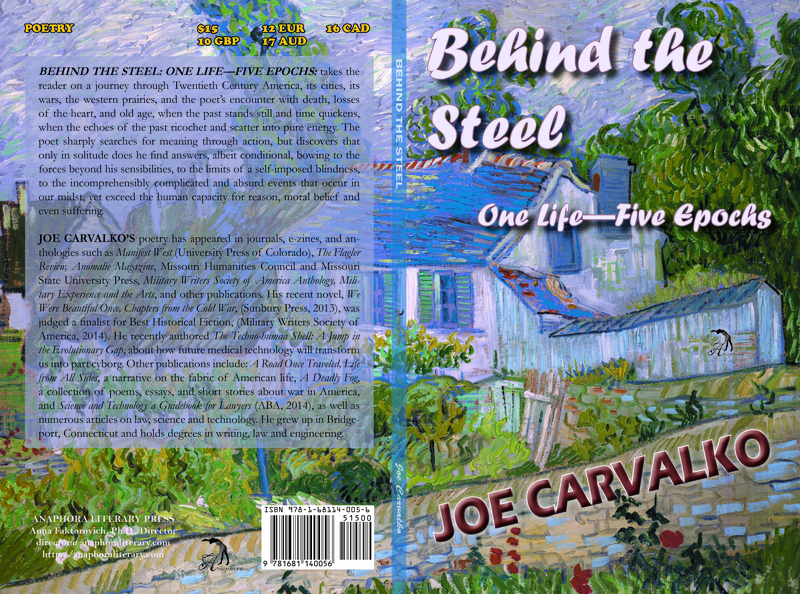 Behind the Steel: One Life—Five Epochs: ($15, 96pp, 6X9″, ISBN: 978-1-68114-005-6, Hardcover ISBN: 978-1-68114-113-8, LCCN: 2014922633, December 2014; Purchase on Amazon or Barnes and Noble): takes the reader on a journey through Twentieth Century America, its cities, its wars, the western prairies, and the poet’s encounter with death, losses of the heart, and old age, when the past stands still and time quickens, when the echoes of the past ricochet and scatter into pure energy. The poet sharply searches for meaning through action, but discovers that only in solitude does he find answers, albeit conditional, bowing to the forces beyond his sensibilities, to the limits of a self-imposed blindness, to the incomprehensibly complicated and absurd events that occur in our midst, yet exceed the human capacity for reason, moral belief and even suffering. Joe Carvalko’s poetry has appeared in journals, e-zines, and anthologies such as Manifest West (University Press of Colorado), The Flagler Review, Anomalie Magazine, Missouri Humanities Council and Missouri State University Press, Military Writers Society of America Anthology, Military Experience and the Arts, and other publications. His recent novel, We Were Beautiful Once, Chapters from the Cold War, (Sunbury Press, 2013), was judged a finalist for Best Historical Fiction, (Military Writers Society of America, 2014). He recently authored The Techno-human Shell: A Jump in the Evolutionary Gap, about how future medical technology will transform us into part cyborg. Other publications include: A Road Once Traveled, Life from All Sides, a narrative on the fabric of American life, A Deadly Fog, a collection of poems, essays, and short stories about war in America, and Science and Technology a Guidebook for Lawyers (ABA, 2014), as well as numerous articles on law, science and technology. He grew up in Bridgeport, Connecticut and holds degrees in writing, law and engineering.